Joshua T. asks: What were all those metal things you see on the beaches in pictures of the Omaha landing? The Normandy Invasions represented one of the single largest military maneuvers in history. Beginning on June 6, 1944, D-Day (see, What does the “D” in D-Day stand for? ), the invasion was the largest amphibious assault of all time and involved what basically amounted to the collective might of a large percentage of the nations in the industrialized world working in tandem to defeat the Nazi war machine. One of the most iconic images of the invasion was that of a French beach covered in oppressive-looking metal crosses. As it turns out, those crosses were merely a small part of an expansive network of sophisticated defences the Allies managed to somehow circumvent in mere hours. Dubbed “the Atlantic Wall” and constructed under the direct orders of Adolf Hitler himself in his Directive 40, the formidable defences stretched and astounding 2000 miles of the European coast. Intended to ward off an Allied invasion, the Atlantic Wall consisted of endless batteries of guns, an estimated five million mines (of both the sea and land variety) and many thousands of soldiers who occupied heavily fortified bunkers and fortresses along its length. The wall has been described as a “three-tier system of fortifications” where the most valuable and vulnerable locations were the most heavily fortified while positions of lesser importance became known as “resistance points” that were more lightly defended but would still pose an imposing obstacle to any invasion force. In the rush to create defences, gun batteries were haphazardly thrown together, consisting of basically whatever the Nazis could get their hands on. As a result, everything from heavy machine guns to massive cannons cut from captured French warships were utilized in the construction of fortresses and bunkers. Though they looked threatening, this “confusing mixture of sizes and calibres” proved to be an issue for the Nazis when they couldn’t scrape together the ammunition to arm them all. Still, the guns, in combination with the several other layers of defences, were believed to make the coast of Europe “impregnable”. The largest of these guns represented the first line of defence of the Atlantic Wall and the Germans spent countless hours practise shelling “designated killing zones” experts predicted Allied ships would most likely use to invade. After this were expansive submarine nets and magnetic mines chained to the ocean floor to deter submarines and ships. In shallower water, the Nazis attached mines to sticks and buried large logs deep in the sand pointed outwards towards the ocean- the idea being boats would either be taken out by the mines or have their bows broken against the poles. 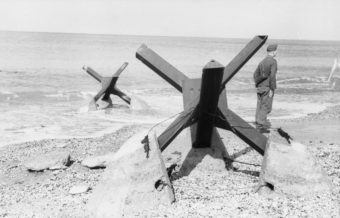 After this was a defensive emplacement known as the Belgian gate which were large heavy fences attached to steel rollers which could be positioned in the shallows. Following this were millions of mines lying just beneath the sands waiting for soldiers who managed to make it ashore. Along with all of this, there were also those metal cross thingies- or to give them their proper name, Czech hedgehogs. As the name suggests, the Czech hedgehog was invented in Czechoslovakia and was mostly designed to serve as a deterrent for tanks and other armoured vehicles, as well as in this particular case if the tide was right, approaching ships attempting to land on shore. Originally designed to sit along the Czechoslovakia-Germany border as part of a massive fortification effort conducted in the 1930s, the hedgehogs never ended up serving their original purpose when the region was annexed by Germany in 1938. It’s reported that the Czechs originally wanted to build a large wall between the two countries, but a cheaper solution was found in the form of these hedgehogs, which could be mass-produced by simply bolting together beams of steel. So what purpose did they serve? Put simply, if a tank or other such vehicle tried to drive over one, the result was inevitably it becoming stuck on the thing, and even in some cases having the bottom of the tank pieced by the hedgehog. When used on a beach like this, as previously alluded to, they also had the potential to pierce the hulls of ships approaching the shores if the tide was high at the time. On top of that, particularly the anchored variety of hedgehogs proved difficult to move quickly as even massive explosions didn’t really do much of anything to them. Speaking of anchored hedgehogs, it isn’t strictly necessary for the hedgehogs to be anchored to anything normally. It turns out that tanks trying to drive over the unanchored ones had a good chance of getting themselves stuck just the same. In these cases what would usually happen was the hedgehog would roll slightly as the tank tried to power its way over, with then the weight of the tank often causing the steel I-beams to pierce the bottom of the tank, completely immobilizing it. In fact, in testing, unanchored hedgehogs proved slightly more effective than their anchored variety against heavy vehicles. However, because of the tide issue in this case, to keep the hedgehogs in place, those closest to the water did have thick concrete bases anchoring them in the sand. Using about a million tons of steel and about 17 million cubic meters of concrete, the broken wall these Czech Hedghogs created was a much more viable option than trying to create a solid wall over such a span, while also not giving the enemy forces too much cover, as a more solid wall would have done. That said, while initially a deterrent, the hedgehogs ended up helping the Allies after the beaches were secured, as they proved to be a valuable source of steel and concrete that was repurposed for the war effort. For example, almost immediately some of the steel beams were welded to tanks, turning them into very effective mobile battering rams. Yes you read that correctly- the Allies cut up dedicated anti-tank fortifications and welded them to their tanks to make them even more badass of weapons. The Soviets also made extensive use of Czech hedgehogs, often using the concrete to literally cement them in place in cities and along bridges to halt German armored divisions in their tracks. As you can imagine, just one of these in a narrow street proved to be an extremely effective barrier that also left the enemy trying to get rid of it open to weapon fire. While some Czech hedgehogs were constructed to specific factory specifications, which stipulated exact measurements (usually 1.4 meters in height) and materials (anything sturdy enough to survive around 500 tonnes of force), most were made of scavenged materials. In the end, the hedgehogs along with the countless other fortifications proved to be a formidable, but not impassable obstacle for the Allies. In fact, thanks to a massive, concerted bombardment effort from the naval and air-based forces of the Allies, strategic commando strikes, and the bravery of the hundreds of thousands of troops who physically stormed the beaches all those years ago, all of the defences were bypassed in a matter of hours, though at the cost of several thousand lives on D-Day alone. The beaches of Normandy were shelled so heavily and so thoroughly mined that to this day it’s estimated that 4% of the beach still consists of shrapnel. Czech hedgehogs are near identical in design (save for their massive size) to caltrops- a tiny metal device designed to always land with a jagged spike pointed straight into the air used extensively throughout history to hinder advancing enemy, particularly effective against horses, camels, and elephants, but also foot soldiers.